Without a doubt, one of the most anticipated openings this year has been that of Bestia, Ori Menashe and Bill Chait's new Arts District-adjacent Italian concept. 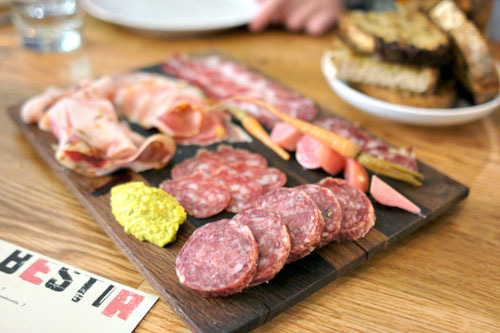 Named after the word "beast" in Italiano, Bestia proudly features the Chef's house-cured salumi and hand-made pastas, with a focus on some of the lesser known, more interesting dishes from across the country. The restaurant played home to the latest iteration of Test Kitchen before finally debuting on November 23rd. About the Chef: Menashe was born in Los Angeles to Israeli parents, but moved back to Israel when he was a mere seven years old. Thanks to his family (they currently run a place called Vitrina), he was exposed to good food at a young age, and after completing his mandatory service in the IDF, moved to Los Angeles to pursue a career in cooking. Menashe started, unsurprisingly enough I suppose, at a middling, now-defunct kosher place called Cafe Blue. He soon left though, and found employment under Jason Travi and Elderoy Arendse at Gino Angelini's La Terza, and became sous chef there after the two decamped for Fraiche. During this period, he also worked at Angelini Osteria, where he really began mastering the art of pasta. From there, Menashe took on a position at Pizzeria Mozza, then transitioned to All' Angelo, under former Valentino chef Mirko Paderno. After a couple of years there, he left to become the Executive Chef at Angelini Osteria, thus coming full circle in a sense. In late 2010, Menashe cooked multiple nights at the first incarnation of Test Kitchen, which, ironically enough, was located right across the street from the former Cafe Blue site. Following the success of TK, he returned to his gig at Angelini, but also started talking to Bill Chait about a solo project. As such, Menashe left the Osteria at the end of March 2011, later taking up a sort of consulting role at La Botte that September. He departed that post at the beginning of this year, focusing his efforts on the opening of Bestia. Inside, there's that industrial-chic aesthetic going on that's all the rage these days, but the 4,100-sqft space does look pretty damn good with all that exposed brick-slash-metal-on-wood action. As far as seating goes, in addition to the standard two-tops, there's a sizeable bar, a smaller salumi counter, the requisite high-slung communal tables, as well as some comfy booths. 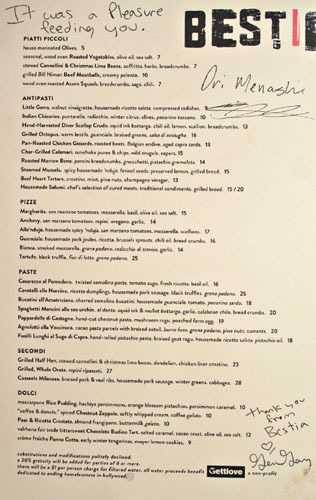 Bestia's menu reads great, and features a wide variety of interesting- and delicious-sounding dishes from various Italian traditions, with perhaps a touch of Cal-Israeli sensibility thrown in for good measure. 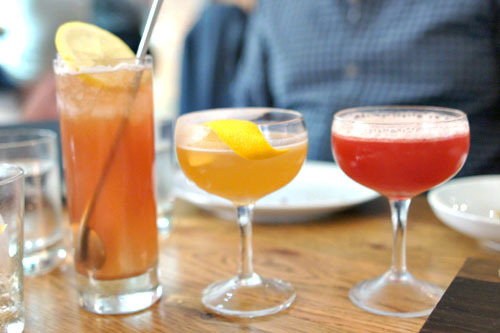 Cocktails are crafted by the inimitable Julian Cox, while wine is the charge of Sommelier/Steward Maxwell Leer (of The Tasting Kitchen, The Bazaar, and LudoBites 8.0 fame). The wine list is still a work in progress, and though the current offerings are limited, in the future you can expect a gloriously-obscure, almost too-cool-for-school selection that won't break the bank. Click for larger versions. Aromatic. [$10.00] | persimmon-infused rye. dolin dry vermouth. amer-bestia. lazzaroni maraschino. Refreshing. [$10.00] | campari. cocchi americano. fresh lime. evaporated cane sugar. seltzer. White Negroni. [$10.00] | ford's gin. kina l'avion d'or. suze. grapefruit twist. 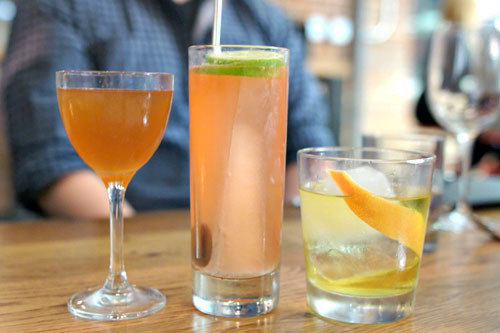 With a mere six cocktails on the list, it was a no-brainer to go for the sextet, starting with the first three. The Aromatic was my favorite here, and, as its name implied, it did have some wonderful aromatics indeed, redolent of bittersweet fruit. On the palate, the sensation continued, joined by strong notes of persimmon that permeated the drink, softening and balancing the flavors at play. The Refreshing also stayed true to its name, with a delicious base of herbal, sweet, and astringent flavors, set off by a touch of lime and made wonderfully effervescent by the seltzer water. Last up was the White Negroni, perhaps the most challenging of the trio, with its multifaceted notes of bitter citrus intertwined with boozy and herbal nuances. 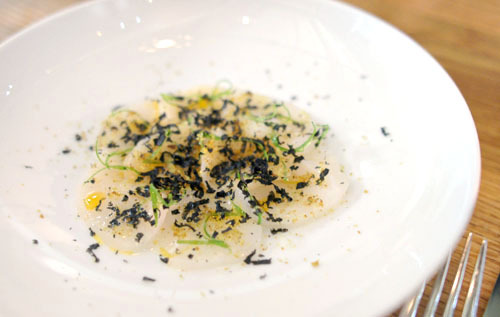 Hand-Harvested Diver Scallop Crudo. 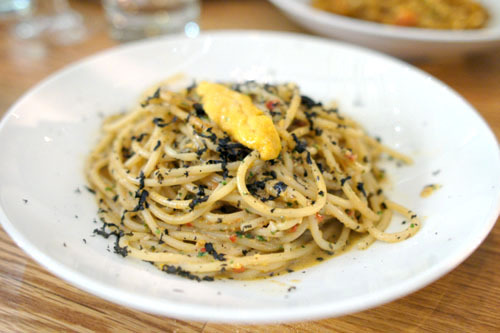 [$13.00] | squid ink bottarga. chili oil. lemon. scallion. breadcrumbs. We began with a crudo dish featuring clean, supple slices of scallop, keenly enhanced by the crunch of the included breadcrumb topping. The use of bottarga here made sense, augmenting the inherent salinity of the cappesante, and I loved the creeping spice imparted by the chili oil; however, I would've liked more acidity from the lemon. Housemade Salumi. 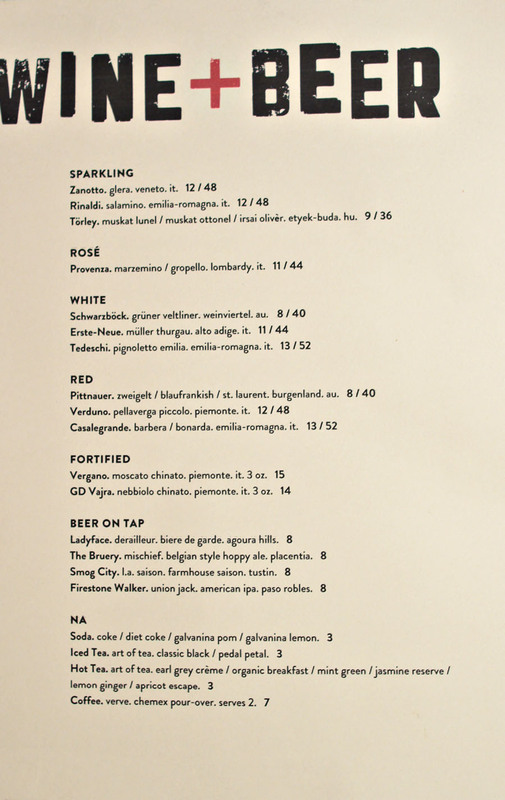 [$20.00] | chef's selection of cured meats. traditional condiments. grilled bread. One of Bestia's best points is its house-made charcuterie, and tonight we were presented with no less than six varieties. I first tried the coppa di testa, a head cheese with a distinct gelatinous consistency and delightfully overarching herb-y notes. The Calabrian pancetta was also quite tasty, with a great savoriness to it and a slight peppery tone. Next was the coppa, with its mouth-watering saltiness and subtly sweet character, as well as the wild boar sausage, which showed off a pretty profound depth. The black pepper-saffron salumi was something special, with a base of peppery flair backed by a fantastic piquancy from the saffron. My favorite thing here, though, might've been the Mangalitsa sausage, made from a rare breed of pig that our server described as the "Kobe beef of pork." I'd imagine that the Kurobuta is an apter comparison, but nevertheless, the salumi was pretty breathtaking, with a wonderfully satisfying texture and loads of porcine goodness counteracted by just the right amount of spice. Paired with the meats was a lovely mustard, some crunchy pickled carrots and radishes, as well as slices of crusty, smoky, savory bread that almost stole the show. Grilled Octopus. [$16.00] | warm lentils. guanciale. braised greens. salsa di acciughe. 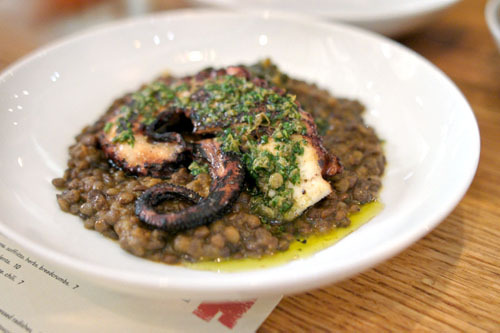 This was another winner, and in fact, may have been the tenderest preparation of octopus that I've ever had, the result of cooking the polpo with wine corks I'm told. In any case, the flavor was on point too, briny and sweet, yet sharply enhanced by the use of an anchovy-based sauce. To balance things out, there were some delightfully earthy lentils, and the bitterness of the braised greens made perfect sense, too. A must try. Sling. [$10.00] | st. george botanivore. benedictine. cherry heering. fresh lemon. angostura. seltzer. Crusta. [$12.00] | amaro nonino. germain-robin craft method brandy. combier. fresh lemon. Scofflaw. [$10.00] | rye whiskey. grenadine. lemon juice. dry vermouth. Making our way down the list, we had here the Sling--no doubt a variation on the Singaporean variety--which showed off the Botanivore gin nicely, with its counterbalancing fruity, bitter, and medicinal flavors set off by light, bright overtones of lemon. The Crusta was my favorite of the bunch, with its fantastic interplay between spicy and citrus-y notes over a base of brandy, beautifully finished by the use of a sugared rim. Also tasty was the Scofflaw, with its sweet, fruity base of grenadine playing foil to the lemon, all while the whiskey did a great job of making itself known as well. Steamed Mussels. [$15.00] | spicy housemade 'nduja. fennel seeds. preserved lemon. grilled bread. 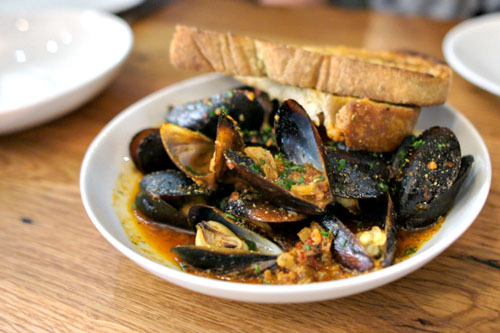 Our server strongly recommended the mussels, and he was right on the money, as this was one of the best preparations of the dish that I'd had in a long while. Plump and springy, the mussels' natural salinity was beautifully complemented by the spicy pork sausage here, and I loved the zing of the fennel as well. And the bread? Mahvelous as well--I had to make sure not to fill up on it. Beef Heart Tartare. [$13.00] | crostino. mint. pine nuts. champagne vinegar. 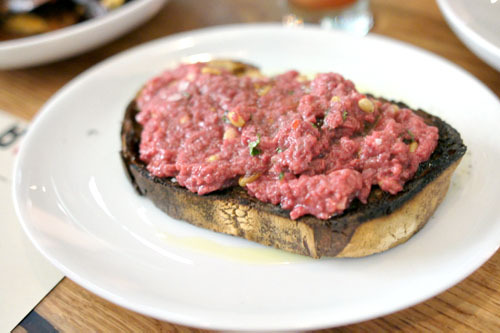 The beef heart tartar was akin to a meaty bruschetta, not necessarily a bad thing mind you. In fact, I found it quite endearing, with the tender, hearty mash of beef brightened up by the Champagne vinegar, while the use of pine nuts added some textural variation. Superb over the toasty bread. Margherita. [$15.00] | san marzano tomatoes. mozzarella. basil. olive oil. sea salt. 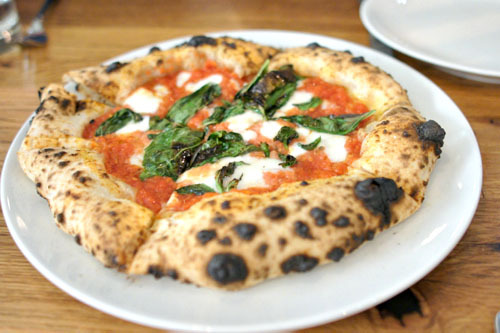 Naturally, we had to give the pizzas a go, and began with the most traditional of them all: the Margherita. It was utterly classic in essence, with the tart, tangy tomato playing off of the aromatic notes of basil in stellar fashion, all while the mozz added heft and substantialness to the pie. The crust, meanwhile, I found fluffy and doughy, with a nice counterbalancing bitterness to it. Tartufo. [$25.00] | black truffle. fior di latte. grana padano. 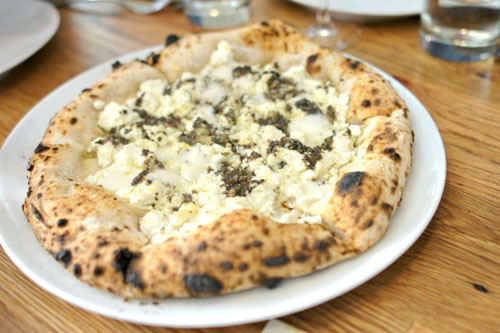 The truffle pizza was, unsurprisingly, hard for us to resist. Strong, earthy notes of tartufo dominated on the nose, while on the palate, such flavors were moderated by the soft, creamy fior di latte, while the Grana Padano added a touch of zestiness to the fray. 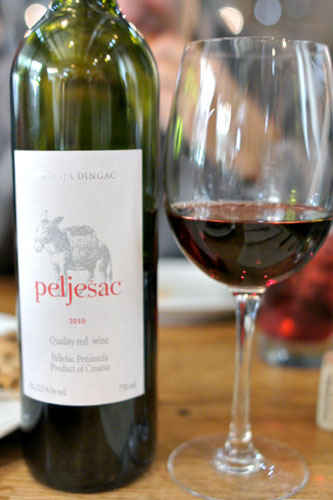 With all the cocktails tapped out, we went with a bottle of the 2010 Vinarija Dingac Plavac Mali Peljesac [$40] from Croatia, an off-menu selection chosen by Mr. Leer himself. I actually liked it a lot more than I thought I would. It displayed some very interesting flavors, with a strong spicy, peppery backbone intermixed with some dry, lightly acidic berry notes. A fun, unusual wine that was drinking wonderfully. Bucatini all'Amatriciana. [$18.00] | charred semolina bucatini. housemade guanciale. tomato. pecorino sardo. Moving on to the pastas now, with his bucatini, Menashe gives a nod to the age-old sauce of all'amatriciana. It was classical in presentation, with the tanginess of the tomato melding well with the salty guanciale, all while the pecorino added an exclamation point to the dish. I was quite fond of the noodles themselves, too, finding them nicely firm, with a slight gritty character. Pappardelle di Castagne. [$19.00] | hand-cut chestnut pasta. mushroom ragu. poached farm egg. Sheets of pappardelle were tasty as well, with a great bite and slightly nutty tinge from the use of chestnut. To that, mushrooms added a mouth-watering earthiness, balanced out by a touch of citrus-y flair in the dish. We can't forget about that egg, either, which lent a creamy, overarching lushness to things that helped tie the course together. Spaghetti Mancini alle sea urchin. [$20.00] | al dente. squid ink & mullet bottarga. garlic. calabrian chile. bread crumbs. 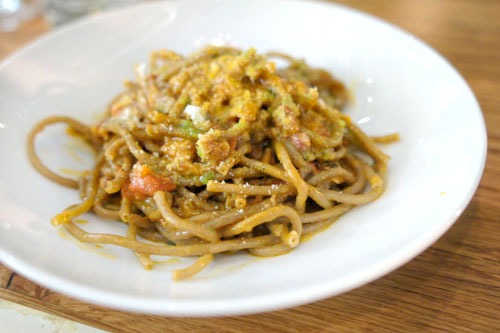 Our next dish featured Mancini spaghetti, one of the few pastas at Bestia that isn't made in-house. Taste-wise, things were just about perfect, with the dish's intensity and brine really recalling the pure, unmitigated essence of the ocean, accented by a touch of chili and garlic complexity. The pasta itself, meanwhile, was advertised as "al dente" on the menu, and boy, was it ever. In fact, it was super al dente, bordering on crunchy, and quite possibly the firmest pasta I'd ever eaten. Talking with the Chef, this was actually intentional, though I can see the texture here being off-putting to many. Cavatelli alla Norcina. [$25.00] | ricotta dumplings. housemade pork sausage. black truffles. grana padano. In our last pasta, Menashe paid homage to the town of Norcia and its famed pork products. It was pretty fantastic, probably my favorite of the quartet, with the sausage just teeming with piggy goodness, and the truffles adding even more decadence to the dish. The pasta, meanwhile, was spot on as well, forming a great foil to the heady elements at play. Desserts at Bestia are the charge of Pastry Chef Genevieve Gergis (Chez Panisse, Mezze, Short Cake), who just happens to be Chef Menashe's wife as well. With dessert, Maxwell Leer presented three glasses of the sweet stuff. 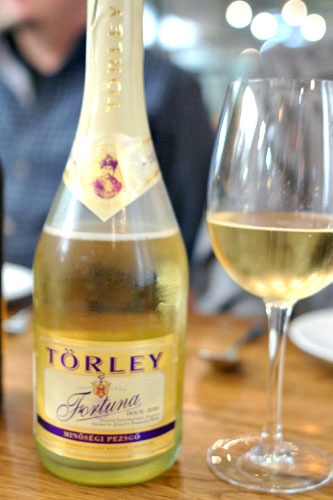 First was the Törley Fortuna [$9] from Hungary, a blend of Muscat Lunel, Muscat Ottonel, and Irsai Olivér. This was a fun, easy-drinking sparkler, just bubbly enough and with loads of sweet, floral, honeyed flavors. We also had the 2006 Patricius Borház Kft. Aszú 3 Puttonyos Leonis [$12], also from Hungary. This one was a bit more complex, with a nice acidity and some tasty sweet 'n' sour flavors going on, accented by a hint of Botrytis character. 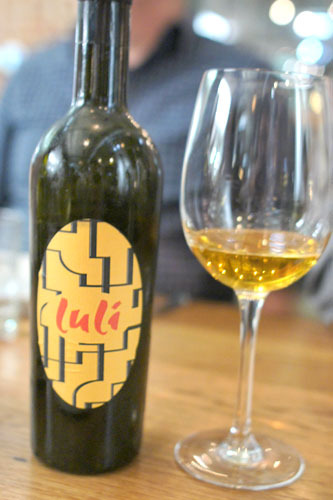 Last up was the Vergano Moscato Chinato Luli, probably the least approachable wine here, but still very enjoyable. There was almost an oxidative quality to it, with loads of orange-y flair balanced by spice and smoke, all leading to a contemplative finish. "coffee & donuts." spiced Chestnut Zeppole. [$10.00] | softly whipped cream. coffee gelato. 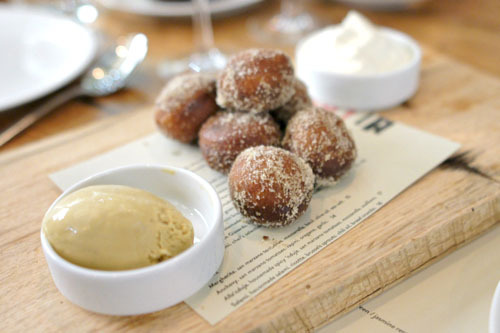 In our first dessert, Gergis gives a wink to Thomas Keller with her own version of his famed "Coffee and Doughnuts." Hers were just as tasty, with a delicious sweet spice to them that paired seamlessly with the intense coffee notes in the gelato. The whipped cream, meanwhile, added a well-placed touch of levity to the mix. mascarpone Rice Pudding. [$10.00] | hachiya persimmons. orange blossom pistachios. persimmon caramel. I've never been a huge fan of rice pudding, but the version here I found quite to my liking. I enjoyed the cool, creamy rice, with its subtle sweetness, beautifully enhanced by some delectable floral and herbal notes in the dessert. At the same time, the persimmons added a marked fruity character to things, and I appreciated the textural variation provided by those pistachios. valrhona fair trade bittersweet Chocolate Budino Tart. [$12.00] | salted caramel. cacao crust. olive oil. sea salt. 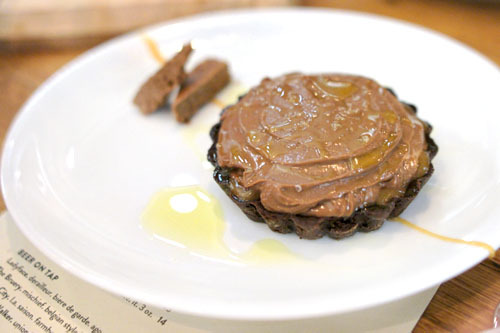 Also delish was the budino tart, with its sweet-but-not-too-sweet flavors of chocolate working gorgeously with the savory nuances imparted by the salted caramel, fleur de sel, and olive oil. Lovely crunch from the "crust," too, which did wonders in balancing out the lushness of the pudding. crème fraîche Panna Cotta. [$9.00] | early winter tangerines. meyer lemon cookies. 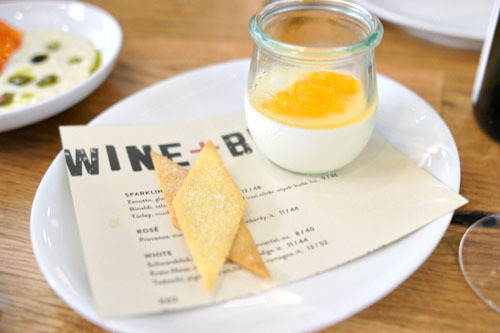 We ended with another strong showing from Gergis: this light, bright, tangy, and citric-laced panna cotta, served with some delightful lemon cookies--a fitting conclusion to the meal to be sure. With Bestia's debut, Ori Menashe and company have been thrust into the pantheon of Italian eateries here in LA. Interestingly, Bestia eschews the hyper-regionality of a place like Sotto (another favorite of mine), but instead highlights cuisine from across the country's varied regions. The result features the bold, lusty, honest cooking that makes Sotto great, but applied to a plurality of Italian culinary traditions. Combined with some great desserts and an expectedly-strong cocktail program, Bestia appears to be poised to become one of Downtown's hottest tickets. Bill Chait's done it again. Good seeing you and Ryan. I agree completely on the Cavatelli, that's the best party by a long mile for me. I went again this week and they put up this great pork chop on the menu as well. It just seems like Southern California Italian food is a bit boring. 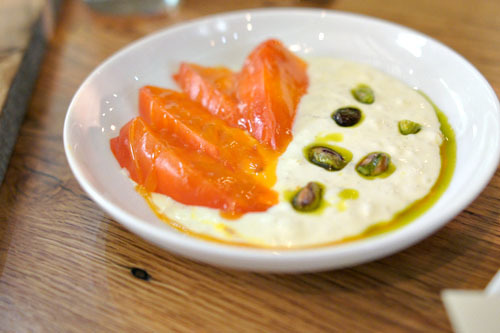 So many restaurants seem like a cookie-cutter clone of mozza/sotto. I'd love to see a more interesting regional diversity. 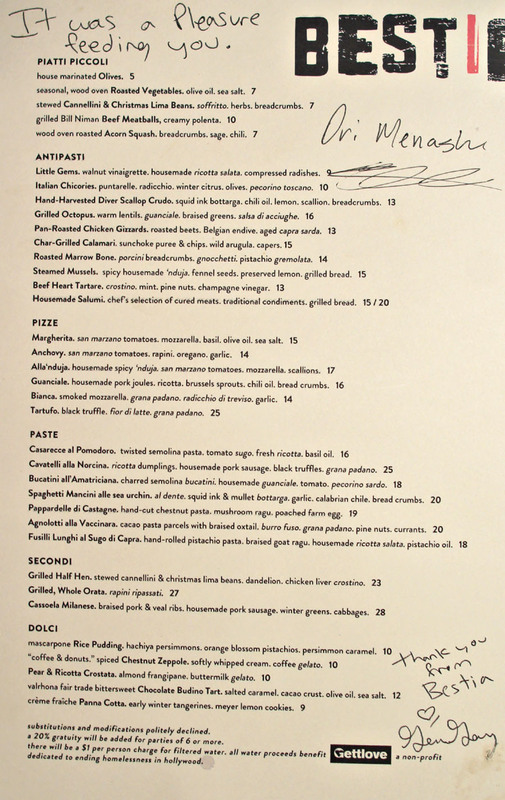 Or a place like Marc Vetri's Osteria. I always enjoy your blog though, sorry for the haterade. I just find So Cal Italian to be getting pretty monotonous and unremarkable. Interesting how Peljesac shows up again. 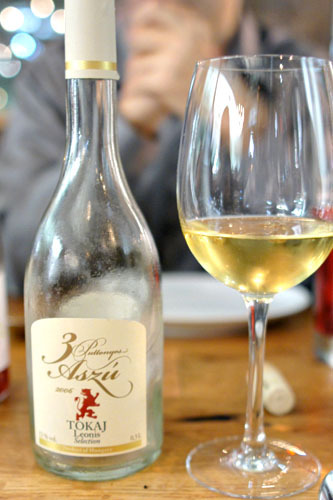 I fondly remember this bottle of wine out of all the others during a wine pairing at Providence a few weeks ago. Good pick! Chris: Me too--good seeing you the other day. Charlie: Nice! That's one area where we didn't hit--the mains (secondi). Cynthia: Yeah, I actually saw the bottle on your FB a while back. Good stuff. 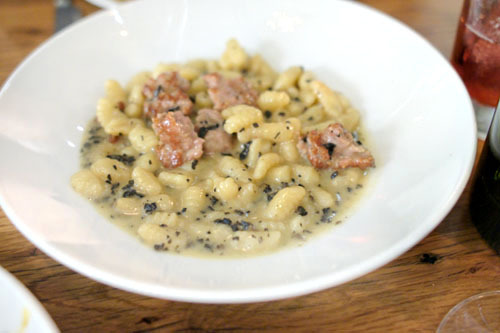 The main kinds of pastas we find in alot of the lauded Italian restaurants in Los Angeles are generic. Sotto and Bestia are no different. 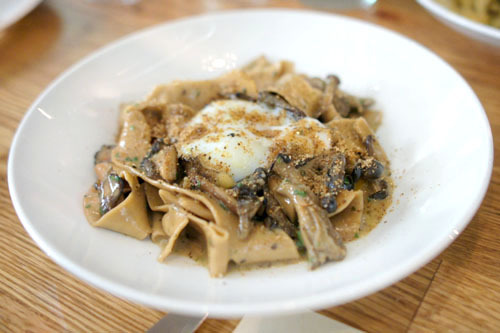 I can name off the top of my head about 5-6 "highly rated" Los Angeles Italian restaurants that do the squid ink pasta, sea urchin sauce, fried egg on top, and flat noodles with mushrooms is done everywhere, as are the tiresome meat ragus. But how many of these highly touted Los Angeles based Italian restaurants offer things like unpasteurized robiola stuffed pastas, cialzons with carmelized legume fillings, risotto-filled agnolottis, porcini and rab-based pestos, or gnocchis/dumplings that aren't just potato or cheese based. I'm just a bit jaded from trying to find really original and innovative Italian dining out here in LA. It just doesn't seem to compare to the diversity of Italian restaurants found out East, not by a longshot. I'm tired of seeing spaghetti, bucatini, ragu, and pappardelle on what seems like every Italian restaurant in Los Angeles. It's just so generic and homogenous out here. I should also mention that many highly regarded chefs have described Mark Vetri as making the best pastas they've ever had. The list includes Mario Batali, Joe Bastianich, and Michael Symon. Joe has gone so far as to repeatedly declare that Vetri makes the best pasta in the country. Maybe it's just having this frame of comparison, as having tried things like the almond tortellini at Vetri, as to why every other pasta I've had in Los Angeles just seems so generic and dull. I had the problem with overly al dente pasta at Angelini also. I hate when people are like "oh, you Americans don't understand what true al dente is" - I've eaten dried pasta in various regions in Italy, and sure, it's al dente, but it's rarely undercooked! Anon: Sounds great. So is the problem that LA chefs aren't capable, or is it that LA diners aren't accepting? Anon: Perhaps it's a fine line sometimes between really al dente and undercooked?